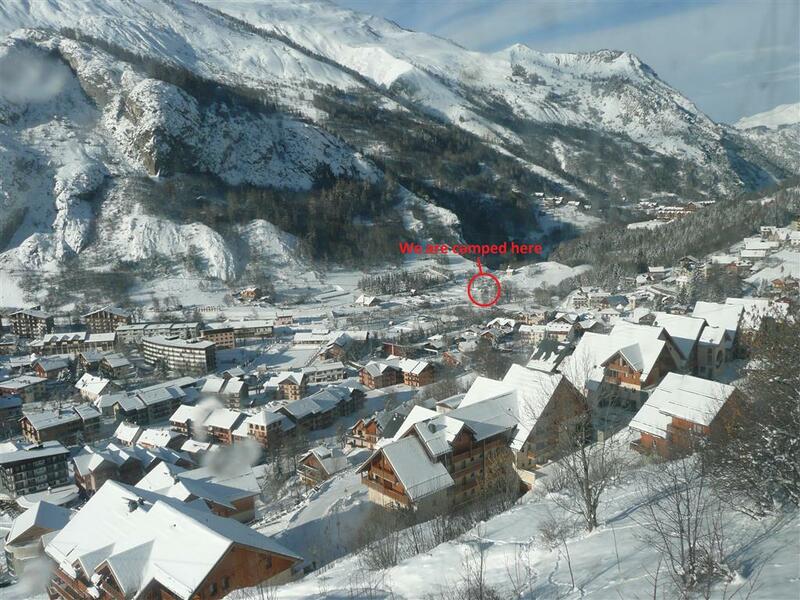 All About Valloire – Do your dream! With all the ski resorts available to us, why did we pick Valloire? 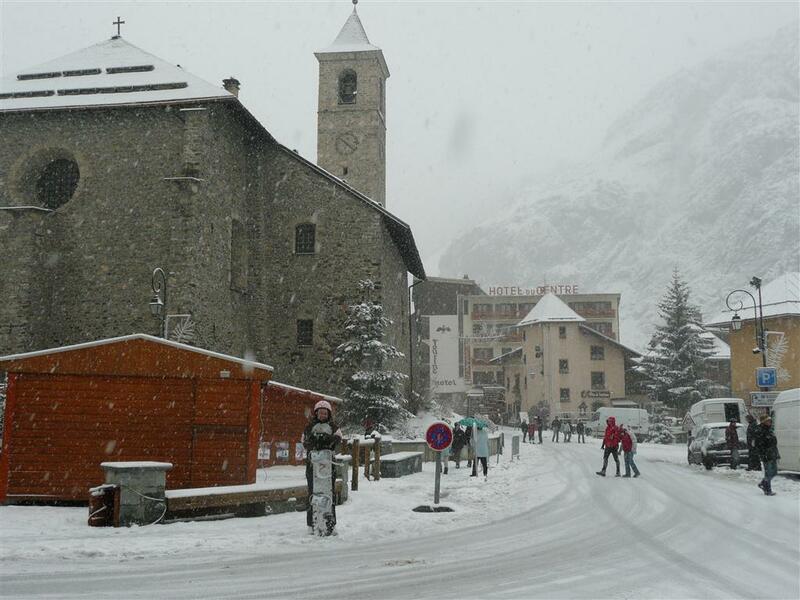 Well quite simply it met a couple of criteria – first it has a reasonable cost campsite in the village with a few minutes walk to the cable car; second it has a large ski area with loads of green and blue runs (as well as red) which we needed to start. And finally, the killer, they did a season ski pass (if bought very early) for €199 – which is an absolute bargain as typically you would pay near €100 for 3-4 days at other resorts. This bargain price changed our minds from visiting multiple resorts for a week to staying put for 6 weeks – probably saving us over £1000 in the process. The campsite offers long-term discounts so we’ll end up paying on average €19 per night which, with 13A power, good facilities, hot/free showers, free wifi etc is good value. 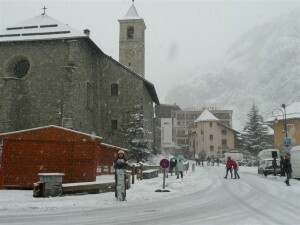 And then even kinder, Valloire gave us a free 3-day pass at Bardonecchia in Italy completely free. 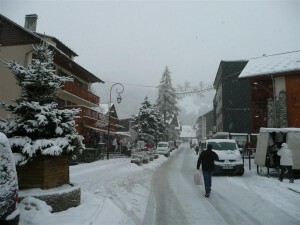 In addition, this bargain pass gives us 40% discount at other resorts in the area – including Orelle Val-Thorens. So all in all, up front and on paper, it looked an excellent value place to visit and worth a gamble even if it wasn’t great and we only stayed a week or two. However, we did our research and learned it was a small but nice resort, not hugely busy nor with a huge night life, and typically French with hardly any brits. The more we read the more we liked, so we booked the campsite and bought our passes online which arrived just before we left. In addition to the ski pass we added on a €20 option to include full access to the lifts during the summer when we can, and probably will, come back with mountain bikes and enjoy the Alps in the summer. Here we can use the free Aire rather than the campsite. On our arrival, the only point to note is that the windy road to the resort wasn’t cleared from snow so it was snow/ice all the way up the pass. This may have been a rare occurrence, but most definitely we’d recommend snow tyres and mandatory snow chains if you plan visiting in the winter. The road seems to clear after 3+ sunny days, but expect the worst! The resort feels better than expected, and unlike some, we don’t get the impression we’re being ripped off. If anything the impression is such that they are trying very hard to do things for your benefit. The pass as already mentioned is one thing, but there is a free ski area for beginners with no pass required; free ski-bus; free shuttle bus; carrefour local and a petite casino charging realistic prices; and the bars and restaurants seem to be fairly priced as well. As for the lifts and cable cars, we’ve never had to queue more than a few seconds and the slopes have plenty of room for everyone and never feel anywhere near capacity. The green runs are very nice to learn on – wide in places with constant gradients, some challenging faster bits, and some tight bits. Plenty of long runs, easy lifts and access, and easy scope to improve. If you are an expert then the resort is likely to be too small for a long stay, but for novices we think we’ll have enough new bits for our 6-7 week stay without a problem. Obviously we’re not rushing to do all the runs as soon as possible, moreso trying to perfect (hahaha!) technique slowly. There are other linked areas which the pass covers (Valmeinier) which we’ve not yet even thought about. The snow and pistes are absolutely fine and well groomed, and there is plenty of off-piste potential – loads of virgin powder snow all over the place. At the time of writing we’ve only eaten out a few times, and we felt very welcome, unrushed, and the meal was excellent value. I’m not sure either of us would change anything – it really is a great and welcoming place and we feel very happy and chilled being here!